With Lulu still recovering from her cranial cruciate ligament surgery, strengthening her hind leg is important. We've always used treat feeders to keep them busy, but they've taken on a new importance: physical exercise. So here are our three favorites. 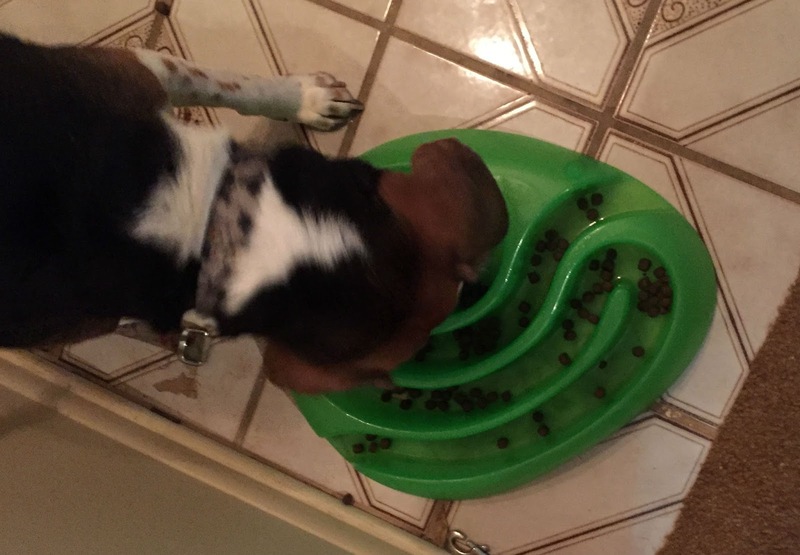 DISCLAIMER: I've received these feeders for free to review, but Life With Beagle received no payment for this post. All thoughts are our own. We use treat feeders for a few reasons. 1. My dogs eat fast. They are fed in separate rooms, no one is going to take their food away, and they get plenty. But they gobble it up like they'll never be fed again. This can lead to bloat and indigestion, like any human. Even slow feeders aren't slow enough. So These treat toys do a better job at making them slow down. 2. It keeps them busy. If they can only get a few pieces of kibble out at a time, they will work and work until it's all gone. And that takes time and effort. And thought too, they have to think about the best way to get the treats out. So it keeps them mentally active. 3. But the new reason is exercise. When Lulu has to roll a treat ball around, she seems to forget her other leg is tender. So she walks on all four feet, and she doesn't favor the leg by kicking it out while she stands or turning out the knee. So she is rebuilding her muscle mass without even trying. With this in mind, here are the pros and cons of each toy. 1. Wobble Ball by P.L.A.Y. P.L.A.Y. (stands for Pet Lifestyle and You) makes innovative toys and pet products. Their Wobble Ball comes in several colors and has a removable insert that acts like a maze. The Wobble Ball by P.L.A.Y. requires a little extra work because it doesn't roll, it wobbles. PROS: Instead of rolling, the toy wobbles, so it requires more effort to get treats out. It comes with a maze to make it more mentally stimulating. But that is removable, so you can put more in. It also is dishwasher safe. CONS: At 18.95, the price point is a little high, also Lulu keeps losing the damn thing! I don't fault the toy for it, but it seems to easily fit in crevices that I can't get into. 2. PetSafe Busy Buddy Kibble Nibble. This egg-shaped treat toy has two openings that treats can come out of. It can hold an entire portion of food. 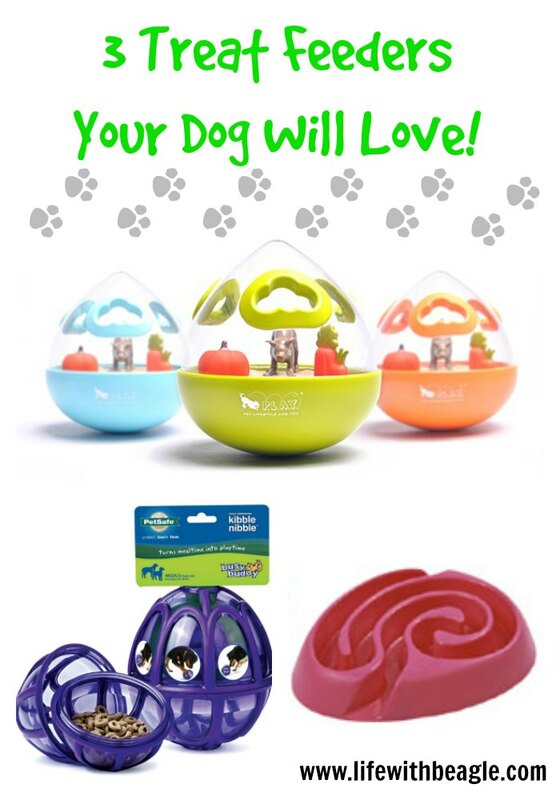 PetSafe makes all kinds of neat treat toys, among other innovative products. 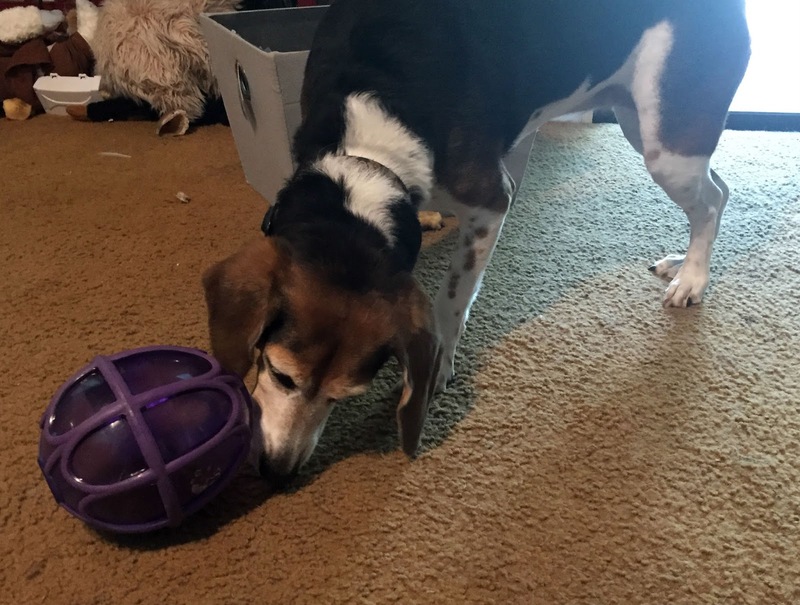 The PetSafe Busy Buddy has two openings at either end. PROS: Even though they have rubber flaps at each opening, they can be trimmed to let more treats out if you wish. Available in two sizes, so it works for small dogs too. It's cheaper than the Wobble at $13.99. CONS: The tread on the toy seems to get caught easily, so sometimes it's tough to close. It also may wear easily, as Lulu has been able to get the toy open in the middle. As you can see, Lulu can get the PetSafe Busy Buddy open. 3. KRUUSE BUSTER DogMaze. A maze for a food bowl. It comes in multiple colors. They make other neat food toys as well, like the Activity Mat. Obviously it doesn't move, but Lulu does have to stand to eat so that's helpful. A good look at the maze inside the BUSTER DogMaze by KRUUSE. PROS: It has openings at opposite ends, so the dogs can root the food out with their nose. It keeps them mentally stimulated because they have to keep the food around. It's dishwasher safe, and comes in two sizes for small and larger dogs. Price is comparable to other food bowls at $16.99 on Amazon. CONS: Even though it's dishwasher safe, it's not always as easy to keep clean. Find all of these treat feeders on Amazon or boutique pet shops! COMMENT TIME! How do you balance treat time/meal time and exercise? Tell us below. We have a snacky mouse that Lexy loves! Lola, on the other hand, will never work for food. She'd rather not eat. You won me over on these! I have never bought one but I know my Django would like them. She will do anything for a bacon treat of any kind and this would probably keep her busy for hours. Ha! When you put the insert in the Wobble ball it does take quite a while to get the treats out. I love the look of all of them! 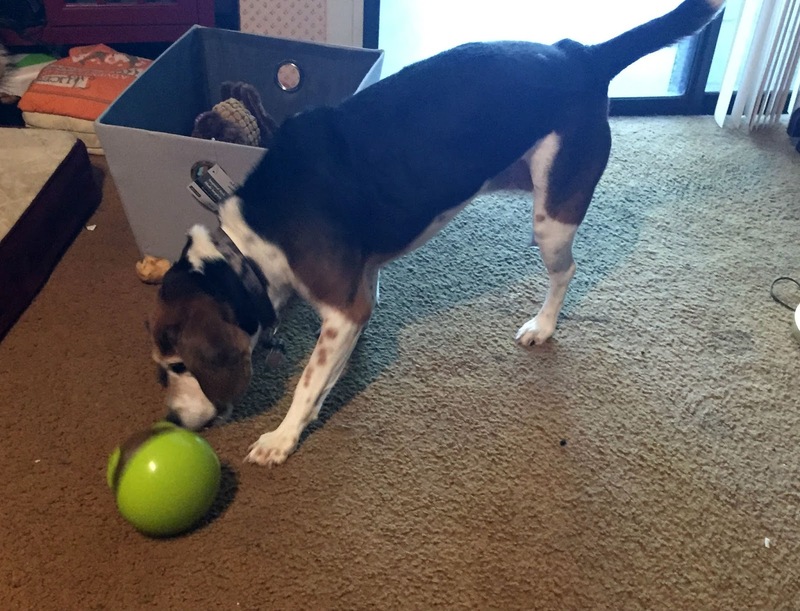 Red's dementia has been interfering with her ability to use a Kong, but she can still use the dog tornado interactive toy. Jack loves his Kong as well but I might give the maze a try and see what he thinks. Thanks for sharing. Give it a try. It's great to slow dogs down. Mr. N mostly eats raw so it's hard to use puzzle toys but I'll put some treats in them occasionally. I like the look of the first one. The wobble ball is awesome and good for treats. These look great. I'm curious if any of three make any noise - bells, squeaks, etc. Our dog Ruby is a bit sensitive and doesn't like anything (toys, etc.) that squeaks or makes noise. We had another treat dispenser but it had a bell in it and totally freaked her out. Nope, they have nothing that makes noise! We have some fun treat feeders but I love that maze type one. Bruin, our youngest Golden tends to eat a little to fast so I think this would be perfect for him. Thanks for sharing! A plush treat toy? Hmmmm. Oh my! I have a fish bowl treat toy for my cat. They have to dig the treats out of the bowl. Look at all those designs! :-) It's gets tougher when one has a raw-fed dog. I mean finding something to use to fill these things gets tougher. But we do use some of these toys sometimes; we particularly did when Cookie was convalescing. What about freeze dried pieces? Great post! We've tried a lot of interactive toys/feeders, but none of what you had listed so I appreciate you sharing your experiences (particularly both the good and bad). Yoda has really enjoyed the Wooly mat from PAW5, so you might want to check that out at some point too. I hope this has helped with both enrichment and PT! I don't think I've heard of that one! I'll have to look it up! Our cats have similar treat excercisers and I know they really slow a pet down. Sometimes a cat can bolt its food way too fast so these are a big help. Fun! 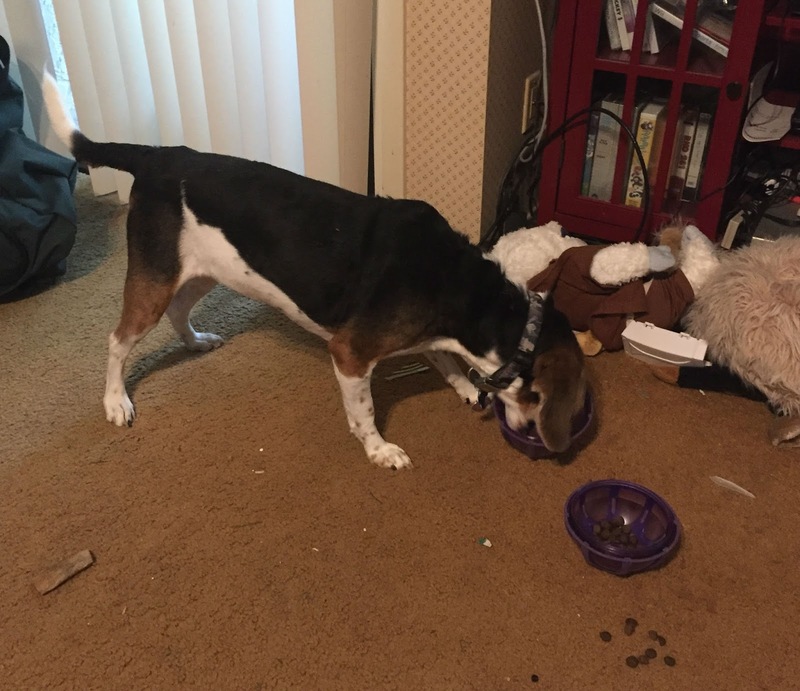 I love using a dog's daily food as training or a busy game. I like the DogMaze since you can use that for raw or cooked dog food. Fun. I haven't tried using a wetter kind of food yet. Good to know. Kilo the Pug is extremely food-motivated (greedy) and lives for meal-time. He seems to worry every meal is his last but he also really enjoys puzzles and toys so I LOVE these. I like that they would slow him down and keep him stimulated. You should check them out this week! These look like fun! My kitties enjoy puzzle feeders too. I think there is a big benefit for them when they have to figure out how to get to a treat. They seem really excited when they finally get it! That's cool that your cats get excited. My pets just seem to move on. lol! Theo and Sophie use interactive feeders most days. I have the dog maze bowl and some other puzzle toys, including a few DIY ones. I would like to add something like the Wobble Ball to our collection. The wobble ball is one of my favorites. I love interactive toys for my dogs! They're both physically & mentally stimulating, which is so important. We've had a couple of feeders like this for our cats. They enjoy trying to get their treats out of it. A few of them eventually get bored with it, but there is always the one determined one who sticks with it until every treat is out! lol. We will have to look into the ones you mentioned! Definitely! And if you don't have it, the fish bowl by Petsafe is great for cats! We had a treat mouse that Brulee figured out how to turn in on its side and she could get all the treats at once.